Well, I did a lot of damage! That may be an understatement. But the good news is, the husband did not seem at all fazed by the amount spent, so yay for that! It was so much fun, too! It was a marathon - it took about two hours from start to finish. And I know I didn't get to browse through everything with as much patience as I could have. Who knows what other gems are hiding out there?! But, for the sake of not going bankrupt, I had to narrow my focus. For this post, I'm sharing all of the stock photos along with outfit selfies I took. Let's get it started! If you're lucky, you can catch all of the dressing room photos still on Snapchat (carylee07). But I never ended up telling you guys what I finally got, so I thought I would try everything on one more time so you can see! Let's start with the cashmere sweater. It's the perfect length for legging season. And hello, cashmere! I got this in an XS. 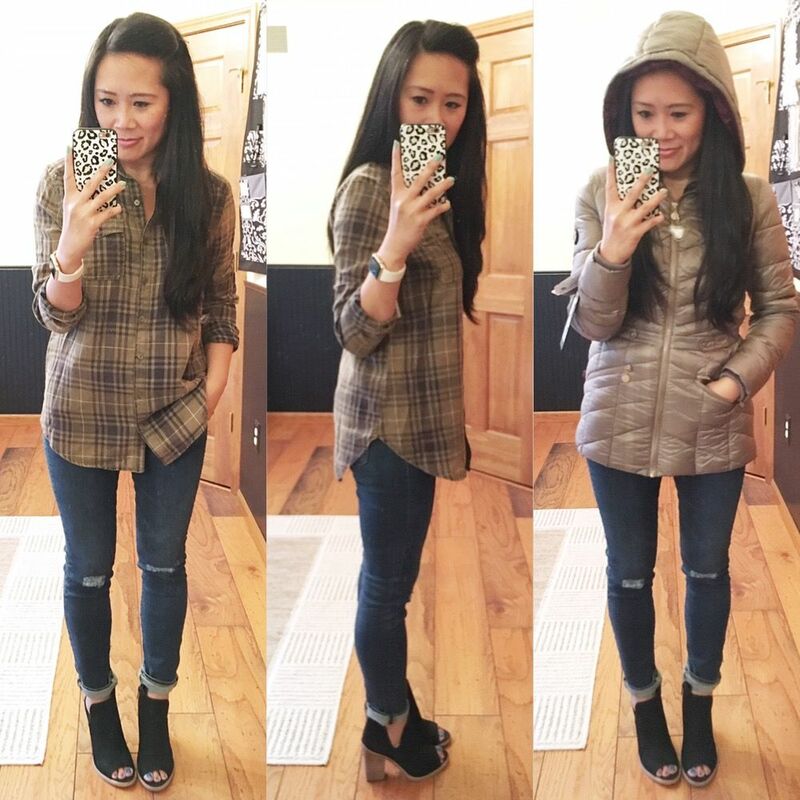 The peep toe booties! You guys!! These are so fun. I was debating on the taupe or the black. I loved both to be honest. But what I love most about them is the cut out and you really couldn't see the cut out that well with the taupe. So I decided to go for drama and get them in black. It also helped that the two ladies next to me also got the black pair and one of them wanted *my* black pair because they were her size. NOPE! MINE! I am happy with my decision to go with black. These fit me true to size. The lace skirt! It was on my wish list and it did not disappoint in person! It's knit so I feel like it has more give than a normal lace skirt. I'm wearing this in a 4. Next is this easy floral top. There's really not much to say about it other than that it is really sweet. I am picturing it with white skinnies. I also picture it under a military jacket in the fall! I am wearing a small. The jeans fit like butta. I am absolutely loving how AG jeans fit me. I am wearing these in a 27. They're ankle length, which means they fit me like regular pants. I folded them since these sandals have a little bit of a higher rise on the ankle, but the actual pant length is perfect on me. The sandals!!!! Hands down my most favorite purchase of this haul. If you only get one thing to splurge on, get the sandals. I will absolutely wear them now and the color makes them fall friendly, too! They are SO comfy. The suede cradles my foot. The footbed is padded. The wood heel make them so walkable. Seriously LOVE these. I am wearing my true size. I am surprised how much I liked this knit tee. It's a super thin ribbed knit, but I don't normally like the look of ribbed knits. But this was just so soft and I loved the way it laid. I bought it in blue also. I am wearing a small. I have been on the hunt for an olive plaid shirt, so this fill that craving quite nicely. It's soft and not too oversized of a fit. I'm wearing an XS. And last but not least is this jacket! It's a bit of a random purchase, especially in the middle of one of the hottest summers we have had in years, but I've been wanting a more casual winter coat. I loved that this is puffy but not bulky. It's deceivingly warm. And it's also packable - it shrinks down into a little bag, which makes it even better!! I am wearing an XS. Ok, now for the stock photos. It's really funny how things translate in stock photos vs. on the hanger vs. in real life. The lighting isn't the best in my selfies, so I definitely think the stock photos provide value, even if only so you can see better detail and correct colors of things. You'll see more things in these stock photos that I didn't model. Well, for one, I'm not going to wear underwear for you, so get that out of your head! But I wanted to include them so you can see my entire haul. WHEW!! This has been the longest, most busiest week ever. 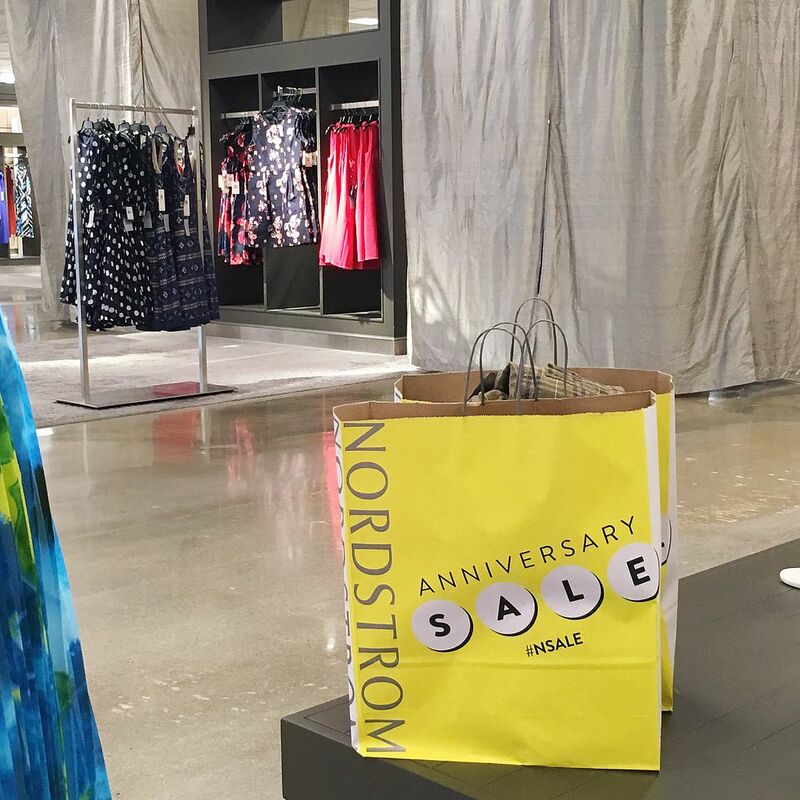 I am both happy and sad to cross the #nsale off my list! I'm also so happy to share my sale finds with you. And of course, I'm so happy to fill my closet with wonderful new things! Please let me know in the comments what you all have bought!! OH my goodness I am so excited for next week, I have a list a mile long of things that I want to try! Thank you, thank you for the prices, so helpful. I might have to splurge on those sandals, they look perfect! great picks, these cut-out booties are so cute. You got some great stuff that I know will get a ton of use! I'm especially loving that striped sweater and your shoe choices. I definitely want burgundy sandals for fall (since it's still warm here in fall), but as much as I love those I think I will hold off for a lower priced pair. The Kendra Scott stuff and a pair of jeans are tempting me most at this sale. Really amazing purchases! Both pairs of shoes are stunning! I also really like the olive plaid shirt and everyone needs a cashmere sweater...especially in stripes! I would love for you to join my On the Edge of the Week Link Up which goes live every Thursday at 5:00 p.m. EST.